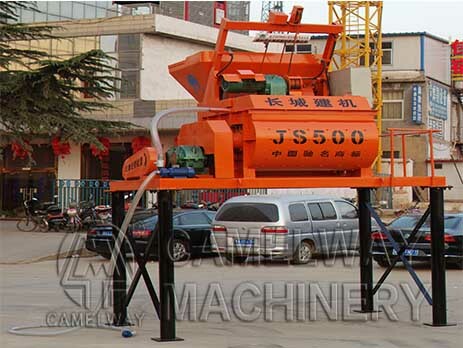 JS500 forced concrete mixer belongs to double shaft mixer series. There are two stirring shaft stirring at the same time, can discharge is 0.5 square, feeding capacity is 0.8 square, and the theoretical maximum productivity is 25 m3 / h. JS500 forced concrete mixer can be used as mixing console of HZS25 concrete mixing plant, also can operate lonely, or used with PLD concrete batching machine. First, using automatic discharging mode. Second, the machine has advantages of easy to add water control, power strong, small power consumption, strong power, and prevent material cluster. Third, JS forced mixer has the advantages of strong and durable, easy to change because it has wear-resisting lining board within cylinder. Fourth, reasonable design, compact structure, convenient operation, reliable work, good quality of mixing, high production efficiency, low consumption, low noise and long service life etc. Zhengzhou CamelWay Machinery manufacture is one of the large-scale enterprise specializing in construction machinery. If you want to know more information about the equipment, you can contact us.